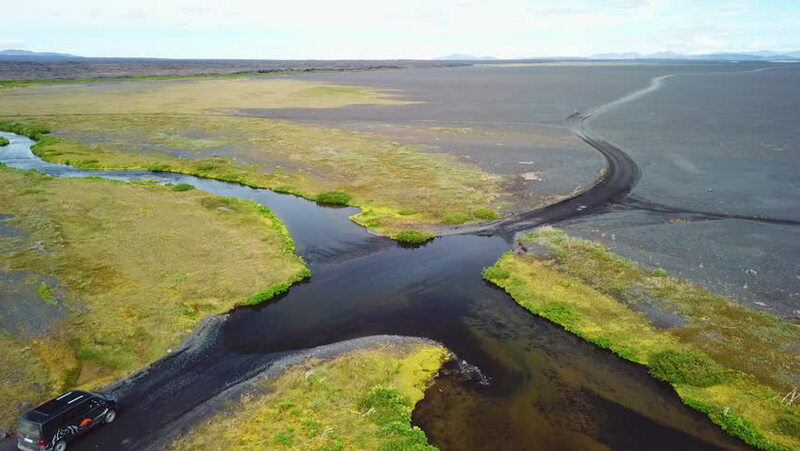 ICELAND - CIRCA 2018 - Aerial over a black van driving through a river in the highlands of Iceland. 4k00:28AERIAL: Flying over an empty coastal road running through the picturesque Faroe Islands. Rocky hills and the tranquil sea surround concrete trail in the grassy Scandinavian countryside on cloudy day. 4k00:29AERIAL, COPY SPACE: Car driving along coastal road and past fish farms in Faroe Islands. Steep grassy hill and beautiful blue bay surrounds tourist car cruising through the picturesque countryside. 4k00:15A rough view of the green wetland from cane, reed, bulrush, at the Dnipro basin with numerous inflows on a sunny day in summer. The sky is covered with fluffy white clouds.